Celebrating The International Tiger Day-2018. 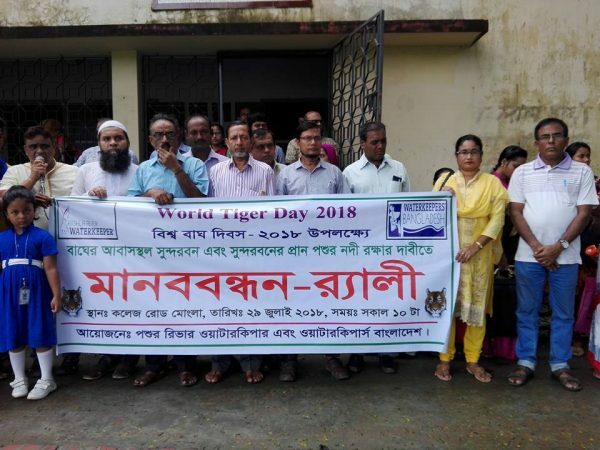 On July 29th, Sunday, Waterkeepers Bangladesh and Pashur River Waterkeeper jointly celebrated The International Tiger Day-2018 by organizing various programs and activities throughout the day. To celebrate the day, human chain, rally, discussion meeting, children’s art competition and prize giving ceremony were organized. The daylong programs were presided by Pashur River Waterkeeper and Coordinator of Bangladesh Poribesh Andolon (BAPA), Bagerhat Md. Noor Alom Sheikh. The eventful day started with human chain and mass gathering at college road, Mongla. Principal of Mongla Government College, Mohammad Golam Sarwar, journalist leader Kamruzzaman Jasim, lecturer Shyama Prasad Sen, lecturer Mahbubur Rahman, lecturer Manoj Kanti Biswas, lecturer Sahara Begum and Nigar Sultana Sumi spoke on the occasion as the chief guest. They all demanded protection of the tigers’ habitat Sundarbans and the Pashur river.Mongla Government College Principal Mohammad Golam Sarwar said, tigers frequently come out of the Sundarbans due to shortage of food and habitat but the villagers kill them because of lack of awareness. The number of tigers in this part of Shundarbans is decreasing day by day. He also added that the International Union for Conservation (IUCN) and the United Nations have already declared tiger as an endangered animal. In the last 18 years, 50 tigers were beaten to death in areas adjacent to the Sundarbans when they came out of the forest due to shortage of food. 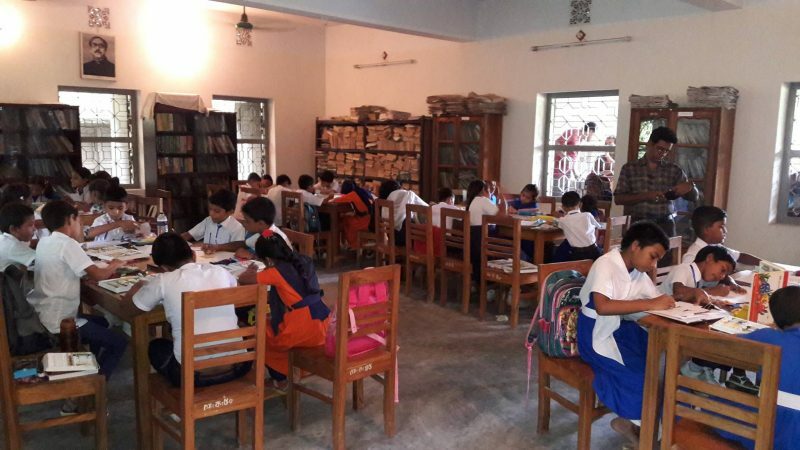 After the human chain a children’s art competition, titled “Royal Bengal Tiger of the Sundarbans,” was held at the auditorium of Father Rigon’s Library at Mongla Government College. Fifty students from different educational institutions participated in the competition. 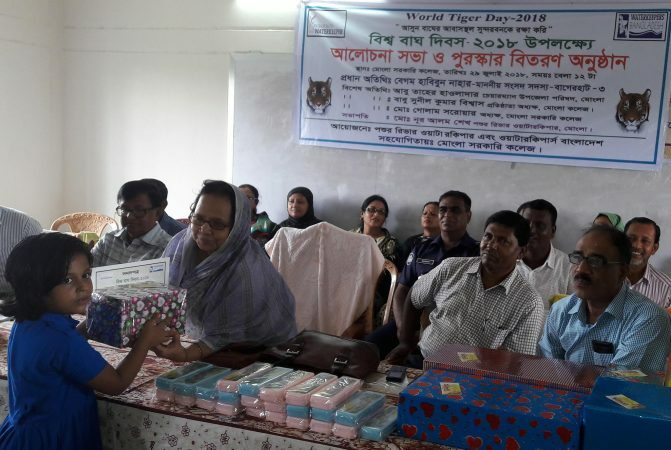 Begum Habibun Nahar, MP of Bagerhat-3 was the chief guest of the discussion meeting and prize giving ceremony. Upazila chairman Abu Taher Holldar, educationist Sunil Kumar Biswas and principal of Mongla Government College Mohammad Golam Sarwar were special guests there. After a short speech, Chief Guest Begum Habibun Nahar MP distributed prizes and certificates among the participants of the children’s art competition. A colorful rally led by Md Noor Alam Sheikh marched across the important places of the town and the Mongla College premises.